Linux system has built-in support for software RAID, through MD devices aka Linux Software RAID. Most Linux distributions such as Red Hat Enterprise Linux (RHEL) and CentOS allows you to easily set up RAID arrays while installing the operating system. However, if you already have a fully functional working and running system with multiple hard disk drives, but have so far running on single disk system, converting from single disk to RAID involves a lot more risks and possibilities of system failure. RAID provides benefits in term of data redundancy and performance improvement, and is recommended setup for mission critical servers. For example, RAID 1 produces a mirrored set, which can tolerate a single disk failure, while potentially speed up performance as read requests can be served by any disk in the array. RAID 10 (RAID 1+0) is a stripe of mirrored sets, or RAID 0 of RAID 1 mirrored sets, which provides better throughput and latency, while tolerate multiple disks failure as long as no mirror loses all its drives. This tutorial provides step-by-step guide on how to manually create RAID 1 on two disks system or RAID 10 on four disks system on a currently up and running system which already has CentOS / RedHat installed. The GRUB bootloader is also configured in such a way so that the system will still be able to boot if any of the hard drives fails. This is useful especially if you cannot access the console on a dedicated server subscribed from web hosting company, which inadvertently prevent you from creating RAID devices during installation. The first phase of migrating a currently running system to RAID without data loss is to ensure all current data is replicated to a degraded RAID. In this tutorial, we’ll work on a system that comes with 477 MB /boot partition as /dev/sda1, more than 900 GB / root partition as /dev/sda2, 4 GB swap space in /dev/sda3, and another 4GB /tmp logical partition /dev/sda5 hosted on /dev/sda4 extended partition. Check and make sure that there are no existing RAID devices running currently. The content of /etc/mdadm.conf file and result of cat /proc/mdstat should be empty, and no arrays should be found in config file or automatically. Change the partition table of disks to MBR with the following commands. Skip this step if your disks do not have GTP partition table. Repeat the command for other drives, i.e. /dev/sdc and /dev/sdd, if applicable. Partition the hard drive according to your preference. If you’re using “fdisk” to manually create partitions, you can use the “sfdisk” command above to replicate the partition structures to others disks if you have more than 1 additional hard drives. For example, “sfdisk -d /dev/sdb | sfdisk –force /dev/sdc” will replicate partitions of /dev/sdb to /dev/sdc. 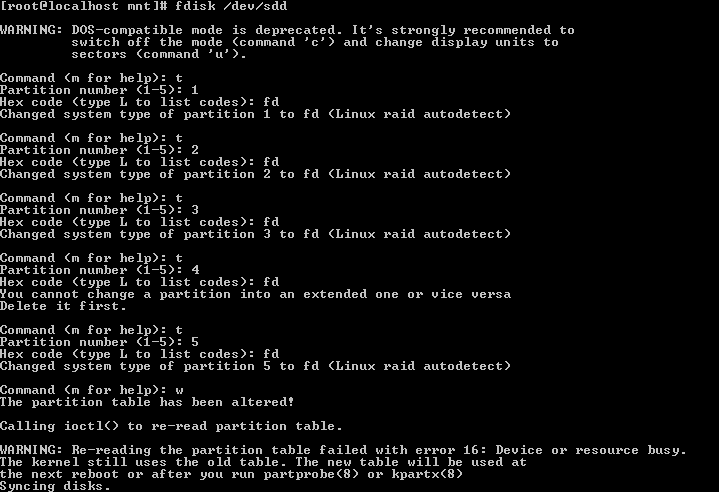 RAID related modules have been loaded in kernel, but no RAID sets are configured. Create RAID devices in degraded state because the one drive is missing, i.e. /dev/sda which is currently installed with OS and used to boot up. As CentOS and RedHat version 5.0 and 6.0 is using Grub 0.97 by default, “–metadata=0.9” is specified so that older version of superblock is used. Otherwise, Grub may respond with “filesystem type unknown, partition type 0xfd” error and refuse to install. In addition, mdadm will also sound a warning for boot array: this array has metadata at the start and may not be suitable as a boot device. If you plan to store ‘/boot’ on this device please ensure that your boot-loader understands md/v1.x metadata, or use –metadata=0.90. The parameter is not necessary with Grub2. The following syntax assumes that we’re building RAID10 arrays with 4 disks. Change to RAID1 if you only have 2 disks by changing the options to “–level=1” and remove the non-existent disk partitions. When prompting whether to continue creating array, answer Y(es). Repeat the process to create RAID arrays for swap spaces and other partitions, if available. RAID array cannot be created on extended partition, with mdadm responds with /dev/sdbX is not suitable for this array. Create the ext4 filesystem to any other new RAID arrays created. Leave the tmpfs, devpts, sysfs, proc and others untouched. Of course, if you know what you’re doing, or have a radically different filesystems, you can modify fstab as you like. Note: Replace $(uname -r) with actual kernel version if the commands doesn’t work for you, especially on a LiveCD. Make sure that NO rn_NO_DM and rn_NO_MD boot parameters are not listed as the options for kernel. When finished editing, save the updated menu.lst. Manually replicate the existing data on existing partitions to new software RAID partitions. On SELinux, also run: touch /mnt/raid/.autorelabel for /boot. Skip the hd2 and hd3 if you have only 2 hard drives. The first part of configuring Linux software RAID support on currently running system has completed. If the server came back, continue with the following procedures to re-add the missing hard disk (e.g. /dev/sda which is running the system originally) to the RAID arrays. The following guide assumes that the remaining disk hasn’t added to RAID arrays is /dev/sda. Change if your device name if different. After the server boots up, confirm the filesystems are mounted on the RAID arrays, i.e. /dev/md0, /dev/md1…./dev/md3. Change the partition table of disk to MBR with the following commands. Skip this step if the disk does not have GTP partition table. Send update to kernel if there is any change. Repeat for other partitions, if applicable. When the recovery of all RAID arrays, perform a system restart. When the system came back up and online, congratulations, you’re now running on software RAID. After RAID is enabled with mdadm, the most important thing is to ensure that email alert notification system is working. Linux software RAID can monitor itself for any possible issue on the RAID arrays such as disk failure, and can send email notification when it found any possible errors.